Abstract. Due to the small-scale and non-stationary nature of the convective wind gusts usually associated with thunderstorms, there is a considerable lack of knowledge regarding their characteristics and statistics. 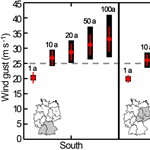 In an effort to remedy this situation, we investigated in this study a set of 110 climate stations of the German Weather Service between 1992 and 2014 to analyze the temporal and spatial distribution, intensity, and occurrence probability of convective gusts. Similar to thunderstorm activity, the frequency of convective gusts decreases gradually from southern to northern Germany. No further spatial structures, such as a relation to orography or climate conditions, can be identified regarding their strength or likelihood. Rather, high wind speeds of above 30ms−1 can be expected everywhere in Germany with almost similar occurrence probabilities. A comparison of the 20-year return values of convective gusts with those of turbulent gusts demonstrates that the latter have higher frequencies, especially in northern Germany. However, for higher return periods, this effect can be reversed at some stations. The values of the convective gust factors are mainly in a range between 1 and 4 but can even reach values up to 10. Besides the dependency from the averaging time period of the mean wind, the values of the gust factors additionally depend on the event duration and the storm type, respectively. How to cite: Mohr, S., Kunz, M., Richter, A., and Ruck, B.: Statistical characteristics of convective wind gusts in Germany, Nat. Hazards Earth Syst. Sci., 17, 957-969, https://doi.org/10.5194/nhess-17-957-2017, 2017.